Supplementary material reads: "Two negs. for Monday. Two negs. 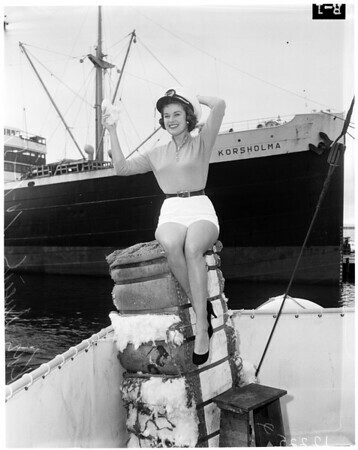 show pretty Kay Lusich, 23, of 508 S. Union avenue, Los Angeles, who was named Los Angeles Harbor entrant for Maid of Cotton contest. She won over five other contestants in judging. She measures 36-24-37 from top to bottom -- a brownette [sic] with green eyes and stands five feet six inches tall".